Oklahoma lawmakers returned to the Capitol Sept. 25 for the state’s first special session since 2013. 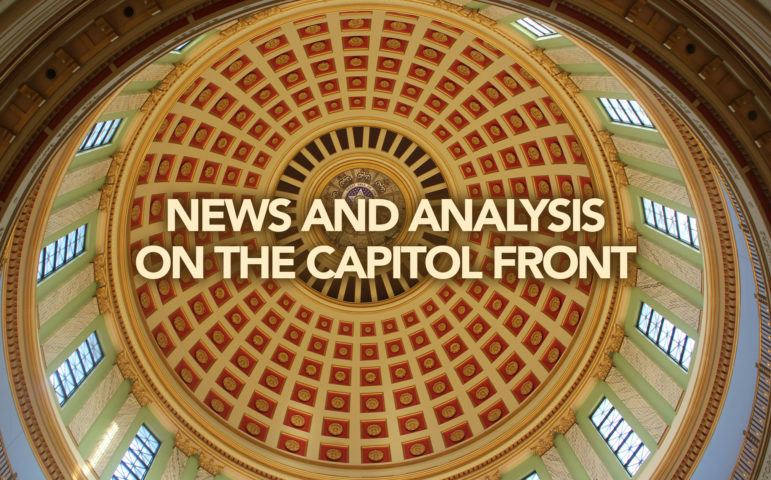 Follow our rolling coverage of developments as lawmakers look to bridge a $215 million shortfall caused by the Oklahoma Supreme Court ruling that the Legislature unconstitutionally passed a $1.50 cigarette fee earlier this year. Even getting to 51 votes to repeal the state’s tax on motor vehicle fuels could prove difficult for the state House, if Friday’s Joint Appropriations and Budget Committee vote was any indication. The proposal, which would fill $67.5 million of the state’s $215 million budget shortfall, is a main component of the state’s backup plan now that has now been pushed to the forefront after the GOP’s latest package failed. That defeat came when a House budget committee split 11-11, with one Democrat, Rep. Jason Dunnington, D-Oklahoma City, voting for a bill to increase fuel taxes, increase taxes in tobacco products and low-point beer, and raise the gross production tax on oil and gas. Six Republicans voted against it. In a statement later Friday afternoon, Gov. Mary Fallin said “drastic across-the-board cuts for all state agencies” are likely now that the tax package has failed. Fallin said this is the “worst-case scenario” that she warned of when she called lawmakers into the special session last month. Budget Chairman Rep. Kevin Wallace, R-Wellston, could’ve cast the tie-breaking vote to send the proposal to the House floor. But he said he abstained from voting since he didn’t believe there was enough bipartisan support for it to ultimately pass the three-fourths threshold that is required of revenue bills once they reach the full chamber. But minutes after Wallace made that statement, Speaker Charles McCall, R-Atoka, indicated that it is unlikely attempts to find a bipartisan compromise will continue. “At this point, it has become increasingly evident that there are likely no options that require 76 votes that can pass in the House,” he said in a statement. Republican lawmakers announced Friday that they will return to the Capitol for a rare weekend session, but leaders told legislators late Friday that they were unlikely to take action on proposals Saturday. That means the special session is likely headed into a sixth week. Lawmakers still have a Plan B strategy that calls for using about $100 million in one-time rainy-day or carry-over funds. But that also would include repealing the fuel tax exemption, which by no means is guaranteed. Not many, if any, Democrats are expected to support the plan to repeal the fuel tax exemption. And Friday’s vote on the tax package that included the fuel, beer, tobacco and gross production tax showed there remains a contingent of Republicans who don’t favor tax increases even if it means helping fill the budget hole. Republicans could potentially lose more votes within their party if they are voting on a package, such as the one in the plan B scenario, that doesn’t include the plan to give teachers a raise – something many in the caucus have wanted. In her statement, Fallin insisted that lawmakers pass additional legislation to spread cuts among all state agencies rather than have the Oklahoma Health Care Authority, Oklahoma Department of Mental Health and Substance Abuse Services and the Department of Human Services absorb them in their entirety. The special session looks to be headed toward its denouement as Republican lawmakers say they will try once more for a bipartisan compromise or move on to a proposal that might not need Democratic support. House and Senate leaders said they will consider a bill in committee Friday that would increase the state’s oil and gas gross production rate from 2 to 4 percent for the first 36 months of a well’s life. This will be added to the House’s previous budget plan that called for giving teachers and state employees raises, restoring cuts to the earned income tax credit and raising taxes on low-point beer, tobacco products and fuel. Democrats rejected that proposal earlier in the week when they argued that any tax package must include an increase of the gross production tax. But Senate opened the possibility of raising the tax when the chamber passed a resolution Thursday calling on the House to add a 4 percent rate to the proposal. House Majority Floor Leader Jon Echols, R-Oklahoma City, said later in the day the House would accept the Senate’s request and run that bill. But it remains to be seen if that amount will be enough to sway House Democrats – a contingent that is needed to secure the three-fourths majority needed to pass revenue-raising measures. 12 months of production, 4.5% for the first 18 months or 5% for the first 36 months of production. Meanwhile, Sen. Greg Treat, R-Oklahoma City, said there isn’t enough support in the Senate to go beyond raising the rate beyond the 4 percent for the first 36 months of production. If a compromise can’t be reached, Republicans outlined their backup strategy Thursday. The main component would be passing a bill that would repeal the state’s sales tax exemption on motor fuel. This, state projections show, would generate $75.1M (with $67.5M available for appropriation) in FY18 and $180.3M (with $161M available for appropriation) in FY19. Lawmakers would then use $23.3 million in Rainy Day funds and $88.4 million in unused rollover funds from last year’s budget to help shore up the budgets of the Oklahoma Department of Mental Health and Substance Abuse Services, Department of Human Services and the Oklahoma Health Care Authority – the three agencies that lost a total of $215 million as a result of the Oklahoma Supreme Court’s decision to overturn the cigarette fee passed earlier this year. This plan would still leave a budget shortfall of $35 million, which would have to be absorbed in not-yet-announced budget cuts unless there are additional revenue ideas proposed. By the end of Wednesday, a sense of bitterness and shock hung about the halls of the State Capitol. A Republican proposal anchored in a set of tax hikes went down to defeat, leaving the state still facing a $210 million budget shortfall and the funding of core services at risk of cuts. The GOP House speaker and a Democratic lawmaker exchanged angry words. The top Democratic leader in the state – the fiery House Minority Leader and gubernatorial candidate Scott Inman – stunned everyone by announcing he would resign by the end of the year. He abruptly dropped out of the governor’s race, saying in a letter that he needed to re-prioritize his life and focus on his family. It was a tumultuous day that ended in the status quo: stalemate. Now it’s on to Plan B – whatever that is – after the Oklahoma House failed to pass a $422 million revenue package that could have ended the month-long special session. The impasse increases the likelihood that the state will be forced to carry out deep and painful cuts to health and human services programs. Nevertheless, lawmakers with the House Appropriations and Budget Committee planned to reconvene on Thursday morning. But what exactly any back-up plan could be remained mystery Wednesday evening. The proposal that would’ve raised taxes on fuel, tobacco products and low-point beer fell well short of the needed 76 votes it would’ve needed to clear the three-fourths threshold required of revenue bills. Only 54 lawmakers – all Republicans – supported the tax package. All of the 28-member Democratic caucus, with the exception of Minority Floor Leader Scott Inman, D-Del City, opposed the plan. Seventeen Republicans also voted against it. Both House Speaker Charles McCall, R-Atoka, and Rep. Cory Williams, D-Stillwater, blamed the other party for the defeat during a heated exchange in the House press gallery as the vote was held open Wednesday. But since Democrats didn’t accept the Republicans’ offer to allow a floor vote on a bill to increase the gross production tax to 5 percent for the first 36 months of production in exchange for their support of the tax package, McCall said Republicans will now look at proposals that don’t need Democrats’ support. 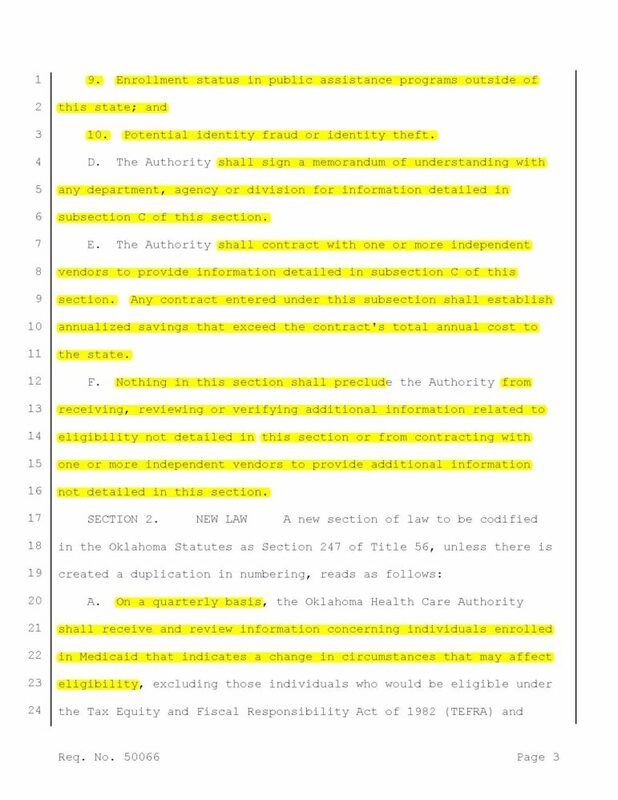 Those 51-vote measures could include eliminating tax credits or sales tax exemptions, tapping carry-over or revolving funds, enacting targeted cuts or spreading out the $215 million in cuts to all state services instead of allowing that burden to fall just on the Oklahoma Health Care Authority, Department of Mental Health and Substance Abuse Services and the Department of Human Services. When asked Wednesday what those measure could look like, McCall did not provide any specifics. One of the largest sources of new revenue lawmakers can access with a simple majority vote could come from repealing some of the many sales tax exemptions the state offers on various services. This could prompt lawmakers to revisit Gov. Mary Fallin’s failed revenue-raising proposal that she announced at the start of this year’s regular session. The largest part of that plan called for eliminating about $840 million in sales tax exemptions on dozens of services, including such things as cable TV bills, haircuts and car repairs. Since the state Supreme Court ruled earlier this year that the Legislature was in its right to remove part of the sales tax exemption on vehicle sales, lawmakers appear to have the green light to do away with these exemptions with a simple majority. A unified Republican caucus, with its 72 members, wouldn’t have troulble accomplishing this. But, as Wednesday’s vote showed, there are division within the party. Several of the 17 GOP lawmakers who opposed the fuel, tobacco and beer tax package said their constituents didn’t want to see higher taxes and that the state can fix the budget situation through cuts and reforms. And many, if not all, likely will be reluctant to consider other tax measures. Most of these lawmakers also signed a letter in February against the governor’s sales tax plan. So judging by Wednesday’s vote, Republicans would have little margin for error in getting to 51 votes. And if they fall under that number, they again would need Democrats to get something passed. Lawmakers are also battling time since the fiscal year, which runs through June 30, is already nearly a quarter over. And lawmakers would need to secure a two-thirds vote to enact an emergency clause to allow bills to take effect right away. If not, they would have to wait 90 days for a bill to take effect. This all means that lawmakers have less time and fewer opportunities to collect the $215 million that would be needed to fill the budget shortfall and avoid budget cuts. That could mean there’s a small chance Republicans could be forced to return to the negotiating table with Democrats. The minority party repeated Wednesday that they would’ve supported the fuel, beer and tobacco tax package if Republicans had agreed to also raise the gross production tax to 5 percent for 36 months, 4.5 percent for 24 months or 4 percent for 12 months. House Democrats faced a blow Wednesday when Inman, who has served as their leader, chief negotiator and spokesman, abruptly announced he is ending his gubernatorial campaign and will resign his House seat at the end of the year. But Williams said Democrats will hold fast in their demand for tax increases to be put on the oil industry or wealthy Oklahomans in exchange for their support of any revenue package. House Budget and Appropriations Committee Chairman Rep. Kevin Wallace, R-Wellston, however, threw cold water on the prospect that there will be compromise legislation. If Tuesday felt like the first week of the special session, it wasn’t a coincidence. Almost a month after lawmakers returned to the Capitol to try find $215 million and avoid deep cuts to health and human services, a political impasse continues to thwart efforts to find a budget solution. Republicans and Democrats largely split among party lines on a vote Tuesday that would raise taxes on tobacco products, low-point beer and fuel. This would raise $183.7 million for the current fiscal year that runs through June 30 and $442.5 million for next year – when it would take effect for the full 12 months. The passage of two other bills advanced out of committee Tuesday – one that would give teachers a $3,000 raise and another that gives state employees a $1,000 raise – both only would take effect if the tax package is signed into law. Similar to an aborted plan to try to pass the cigarette tax earlier in the session, the vote was enough to pass out of committee since doing so requires just a simple majority. But it also once again lacked the margin to clear the 75 percent threshold that is required of revenue-raising bills once they are voted on the floor. This is nearly the same scenario that lawmakers found themselves in when GOP leaders tried to pass the $1.50-per-pack cigarette tax during the first week of the session. During that attempt, GOP leaders hoped they could convince Democrats to support the proposal instead of negotiating with the minority party to include revenue-raising proposal they wanted. But just two of the seven Democrats on the budget committee voted to advance that bill. And after it became clear that the measure would not receive the necessary 76 votes on the floor, GOP leaders pulled the bill. This time, all six Democrats on the budget committee voted (House Minority Leader Scott Inman, D-Del City, was absent and didn’t vote) against the cigarette, fuel and alcohol proposal. Democratic support now, as it was before, is crucial since Republicans hold just 72 seats in the 101-member chamber. And 76 votes are required to achieve the 75 percent threshold that is required of revenue bills. And even if some Democrats decide to support the budget plan – something no Democratic member has publicly stated they would do as of Tuesday afternoon – there could be enough Republican no votes to defeat the bill. The three Republicans who voted against the tax plan during Tuesday’s committee hearing – Reps. John Bennett, R-Sallisaw; Kevin Calvey, R-Oklahoma City; and Jason Murphey, R-Guthrie – voiced concerns that could be echoed by other GOP lawmakers who have been reluctant to support any type of tax increases in the past. Those concerns included the effect it will have on the trucking industry, whether this is a regressive tax that would unfairly target lower-income residents and if there are other solutions to solve the state’s budget crisis. This again mirrored the aborted plan to fill most of the budget gap by passing the cigarette tax during the start of the special session. On that proposal, Calvey, Murphey and Bennett also voted no. Heading into a possible floor vote Wednesday without an assurance they have the votes for it to pass, Republican leaders find themselves in a familiar conundrum: They could once again scrap the votes or force their members to cast a tough vote on something unlikely to pass. But top Republicans maintained there would be enough support from their caucus to pass it if all or a large majority of Democrats support it. Democrats have previously said they would only support the cigarette tax if Republicans attach it to a increase to the state’s gross production tax on oil and gas. And they said they would support the fuel tax if it were tied to higher income taxes for top earners. Majority Floor Leader Jon Echols, R-Oklahoma City, publicly offered a new deal during Tuesday’s meeting in which he would put a stand-alone vote to raise the state gross production tax on oil and gas to 5 percent if Democrats support the alcohol, fuel and tobacco taxes. Democrats, however, balked at that idea. Instead, Rep. Jason Dunnington, D-Oklahoma City, countered later during Tuesday’s budget meeting that Democrats would support the alcohol, fuel and tobacco taxes if Republicans included the 5 percent gross production increase to that same bill. But that didn’t seem to garner much support as the below Twitter exchange between Rep. John Cockroft, R-Wanette, and Rep. Monroe Nichols, D-Tulsa, showed. Without a compromise, lawmakers will have to once again return to the drawing board to find a bipartisan agreement. Or Republicans will shift to a not-yet-announced plan using 51-vote measures to repeal tax credits, shift funds and enact budget cuts without the help of Democrats. Hours before a budget package from Gov. 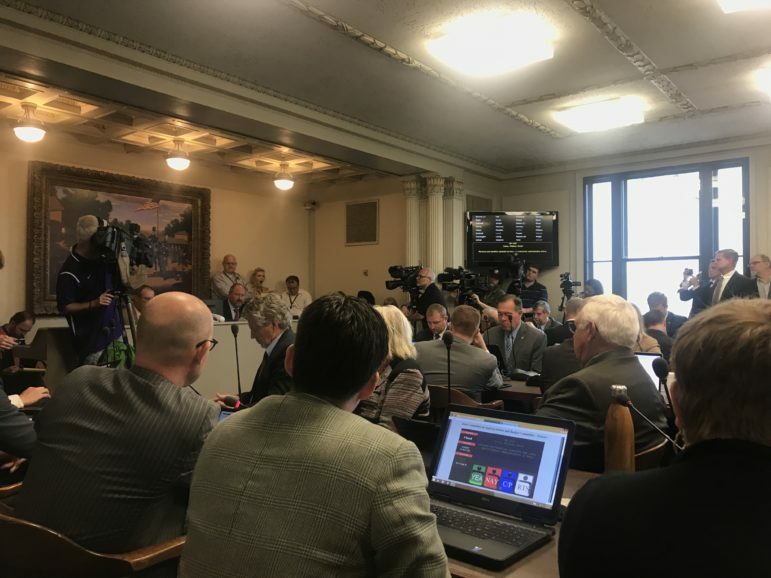 Mary Fallin and GOP legislative leaders gets its first committee hearing, lawmakers on both sides of the aisle were speculating on what happens if the deal fails. The bills, which include raising cigarette, alcohol and fuel taxes, as well as giving teachers and state employees a raise, are to be heard in the House Joint Committee on Appropriations and Budget at 1:30 p.m. Tuesday. If they receive the basic majority votes to get out of committee, there could be a floor vote in the House as early as Wednesday. But lawmakers from both parties suggested the measures will likely fail and are looking to what comes next. House Democrats announced their opposition to the GOP-backed plan Monday in a press release that “demanded” Republicans return to the negotiating table. Backing from the minority party is crucial because Republicans control 72 seats in the House; 76 votes (75 percent of the 101-member chamber) are needed to pass revenue-raising bills. That has led Democrats, including Rep. Emily Virgin, D-Norman, to call the GOP’s plan a political stunt that is doomed to fail. Some GOP lawmakers also took to social media to cast doubt that the budget deal will be successful. Rep. Roger Ford, R-Midwest City, said he believes the vote will “bomb” without Democratic support. In a Facebook post, Ford said he and several other Republicans pushed leadership for a vote on a gross production tax increase – something that Democrats say would unlock their support for the cigarette tax. Rep. John Cockroft, R-Wanette, similarly wrote that he believes the vote will fail. Fallin and legislative leaders haven’t publicly disclosed their Plan B if the package fails to get out of committee or doesn’t receive the necessary three-fourths vote on the floor. This, he wrote, will be “exponentially harder” and “extend the special session even longer” than if a compromise between Republicans and Democrats could be found. The nearly month-long special session remains up in the air even after Gov. Mary Fallin and Republican leaders announced a budget package Monday that would stave off cuts and give raises to teachers and state employees. The deal would increase the state’s cigarette, fuel and alcohol taxes. It would also restore cuts to the earned income tax credit and provide teachers a $3,000 raise and state employees a $1,000 raise. This was the first time Fallin and House and Senate leaders all rallied behind a specific budget plan. But notably absent at Monday’s press conference were any Democrats. And the plan excluded any increase to the state’s oil and gas gross production taxes or income taxes – two concessions Democrats have long demanded be part of any deal. Fallin and Republican leaders left the press conference without taking questions or providing details of the deal or the strategy to get it passed. 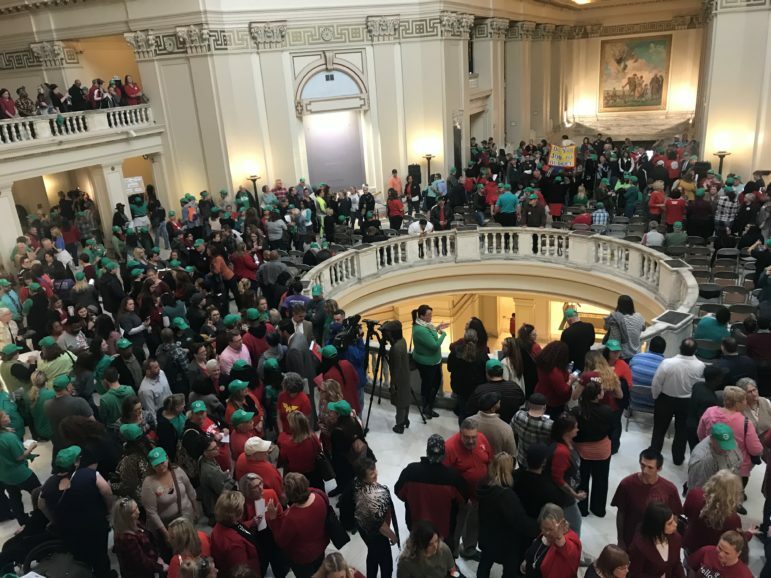 But leaving the event, Sen. Greg Treat, R-Oklahoma City, conceded that Republicans will need Democratic support and called on them to support the plan and give teachers a raise. Without Democratic support, any tax increase package would essentially be dead on arrival since the state Constitution require 76 votes for revenue-raising proposals. Republicans hold 72 of the 101 House seats and would need at least four Democrats to pass the proposal assuming all GOP lawmakers support it – an unlikely scenario since nearly two dozen Republican House members have been reluctant to support any tax increases. Minutes after the Republicans’ budget announcement, several Democrats took to social media to denounce the plan. Neither the governor nor legislative leaders said whether they would put their proposal to a vote even if it seemed unlikely to pass. And with details of the plan still being worked out, it is unclear as of Monday when a bill will be drafted. Each passing day without a deal to bridge the state’s $215 million budget shortfall means less potential revenue will be available if lawmakers pass one or multiple tax increases. 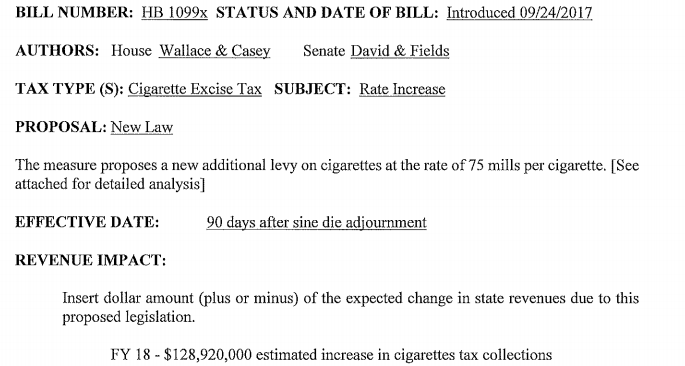 An Oklahoma Watch analysis of state projections shows that each day that lawmakers don’t pass the $1.50-per-pack cigarette tax would cost the state between $680,305 and $712,265 in potential new revenue, depending on what calculations the state uses. Had lawmakers passed the tax increase during the first week of the special session, which was the House Republicans’ plan at the time, it would have generated $128.9 million for the current fiscal year (it ends June 30), according to Tax Commission numbers. The estimate tax collections on the new cigarette rate would have taken effect Jan. 1 since the state Constitution blocks revenue-raising bills from taking effect for 90 days after they are signed into law. But the state’s inaction, so far, on the proposal means it no longer could take effect by that date even if lawmakers were to pass a bill this week. Budget negotiators are now looking at a potential cigarette tax increase that could take effect by Feb. 1, according to projections from the governor’s office. That would bring in $102 million – a difference of $26 million from the original estimate. And its possible that amount – as well as potential revenue for other proposed tax increases – could be lowered even more unless there is a breakthrough on the stalled budget negotiations. This task could be further complicated by a long-scheduled closure of the Capitol that will occur from Oct. 13-23. That could even potentially push the special session in November and cause any tax increases to take effect after Feb. 1. Under this scenario, lawmakers could be forced to find more revenue-raising options outside of those discussed in recent days. Or, instead of finding more money, they could look to cutting state spending. Legislative leaders canceled a previously scheduled budget meeting for Tuesday that could have been used to introduce new bills to bridge the shortfall. The move, which signals that Republican and Democratic budget negotiations have yet to find a deal, means that the special session likely will continue for days, if not weeks. Gov. Mary Fallin denied Thursday that she had struck a “deal” with House Democrats to bridge the state’s $215 million shortfall and find extra money for a teacher pay raise. Her comments came hours after Democratic leader Rep. Scott Inman, D-Del City, announced what he called a “bipartisan” compromise that could break the stalemate that has divided lawmakers since they were called into special session last week. That deal, Inman said, included raising cigarette taxes, the state’s fuel tax, income taxes on high earners and the state’s gross production tax on oil and gas. It would also repeal some sales tax exemptions on the wind industry and some services. Inman said Fallin and Senate leaders were on board with the plan and only House Republicans would need to agree to it. Fallin confirmed that her senior staff met with Inman Wednesday and she provided legislative leaders of both parties a worksheet with “previously discussed ideas.” That worksheet, which Oklahoma Watch has reviewed, includes revenue projections for the proposals Inman discussed earlier in the day. But she said calling this a deal was premature. “If there’s only one person at the altar, there is no marriage,” Fallin said, referencing the fact that only House Democrats were present when Inman announced the so-called bipartisan agreement. It was her proposal. She invited us to the altar. We said yes. If she is having cold feet, the people of Oklahoma are in serious trouble. The back-and-forth is the latest sign that lawmakers and the governor’s office remain at an impasse over the budget. Fallin said she hopes they can soon announce an agreement. But it doesn’t appear one with bipartisan support is imminent. House Democrats announced their support for a six-part package that would shore up Oklahoma’s budget through the biggest tax increase the state has seen in decades. Minority Leader Scott Inman, D-Del City, said Senate Republicans and the governor’s office have assured him of their support of the deal. But those two parties have not publicly signed off on it. And House Republicans – the main group that has been an obstacle to getting a deal done – have also yet to signal any support. But Inman said the fact that Democrats are on board with the plan, which includes several elements that both parties have been at odds over, marks a breakthrough in the budget negotiations that have drawn on since the special session began last week. Here is a breakdown of the deal, according to a document from the governor’s office obtained by Oklahoma Watch. Inman called the proposal a $560 million deal. But the governor’s projections show that it would raise $265 million for the current fiscal year that ends June 30. That’s because the state Constitution blocks revenue-raising measures from taking effect until 90 days after their passage. The state envisions an effective date of Feb. 1 for most of the measures. 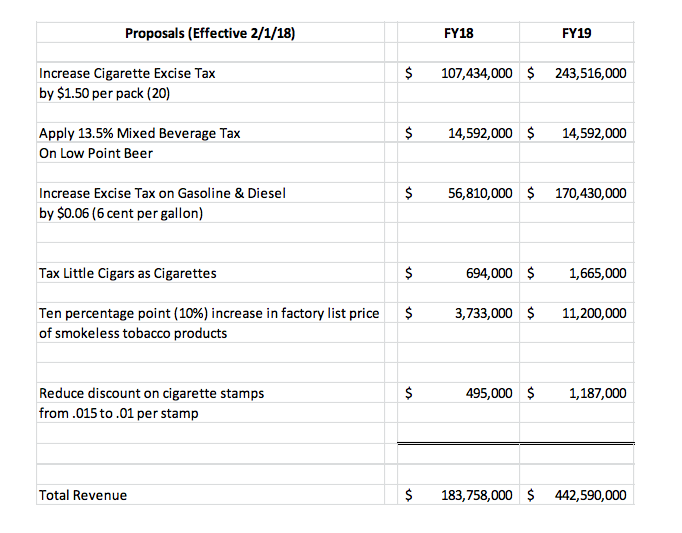 The $1.50-per-pack cigarette tax increase is, by far, the largest component of the plan, with projections showing it would bring in $102 million this fiscal year and $245 million for the 2019 fiscal year. The $0.06 fuel tax increase ($54 million this fiscal year and $161 million in fiscal year 2019) is the next largest. The cigarette tax has been the only tax increase that House Republicans have signaled they would support. And Senate Republicans endorsed the fuel tax proposal in the regular spring session. But the two main proposals in the package that Democrats have fought for – the 5 percent oil and gas gross production tax and the income tax increase on high earners – make up a relatively small portion of the revenue-raising measures. The gross production tax, which would only take effect on new oil and gas wells, would raise under $5 million for this fiscal year. And the new income tax brackets would bring in $10.8 million. But they play a key role in budget negotiations since Democrats have said they would only support the cigarette tax if it is tied to a gross production tax increase and would only support the fuel tax if it is tied to an income tax hike. Democrats also have argued that increasing these rates will have a bigger impact on future budgets. The proposed gross production tax increase, which boosts the rate from 2 percent to 5 percent for the first 36 months of wells’ production, for instance, could make a big difference if an expected spike in drilling activity occurs over the next few years. This one-time spending would be needed to cover the entire $215 million shortfall. It would also provide enough extra cash ($52 million) to pay for a $2,000 teacher pay raise that Inman said is part of the Democrats’ deal. But shortly before Inman announced what he called a “bipartisan compromise,” House GOP leaders stressed that a deal was not imminent. In a Facebook post, Majority Floor Leader Jon Echols, R-Oklahoma City, said lawmakers will take the “next couple days” reviewing all proposal that are still on the table. And he said without a compromise that includes raising revenue and requiring budget cuts – something not in the Democrats’ plan – a solution will not happen. Echols, who earlier this week notified lawmakers to be ready to return to the Capitol by Monday for floor votes, said it’s possible a deal will not be ready by that time. That could complicate logistical matters since a long-scheduled shutdown of the Capitol for renovations will occur from Oct. 13-23. But Inman said lawmakers are exploring other locations to hold legislative activities if they need to act during that time. Does Fallin Support a Gross Production Tax Increase? Oklahoma budget negotiations remain at stalemate, more than a week since the state’s first special session since 2013 started. But a key player in the process says there is reason for optimism: Gov. Mary Fallin has endorsed a plan that includes raising the state’s gross production tax to from 2 to 5 percent, House Minority Leader Scott Inman said. However, when contacted by Oklahoma Watch Tuesday, Fallin’s office was noncommittal about the gross production tax increase and other options. And House Republicans last week failed to accept the plan containing options supported by Fallin, the Tulsa World reported Sunday. Inman, D-Del City, said the proposal – one long advocated by his caucus – is part of a package that would help bridge the state’s $215 million budget shortfall and even provide extra money for teacher raises. Although specifics are still being worked out among budget negotiators, other components of the plan also include increasing the cigarette tax, gas tax, income tax for high earners and some services. The governor’s office has not confirmed the specifics of the plan. But Chris Benge, Fallin’s chief of staff, said Friday that the governor has given lawmakers a list of proposals that she would support. Fallin spokesman Michael McNutt declined to confirm whether she supports a gross production tax increase and other items on the House Democrats’ list, saying that the governor wouldn’t comment on negotiations. He denied that a formal plan exists. “The governor calls it an inventory of ideas,” he said. Fallin asked the Department of Management and Enterprise Services to put together estimates for a number of options, some of which emerged from the regular legislative session and some from meetings during the summer and special session, McNutt said. “Her intent it to try to get something decided,” he said. In a subsequent statement, Fallin elaborated on the budget document and said she and her staff have spent several months listening to ideas as well as providing their own. Fallin added that the “framework” she presented meets her goals of filling the $215 million budget hole, providing teachers a pay raise and addressing long-term structural budget deficiencies. A key obstacle remains that could block a budget deal, even with Fallin’s potential endorsement. House Republicans have, so far, balked at looking at any tax increases other than raising the cigarette tax. House Republicans planned to further discuss their options Tuesday in another closed-door meeting. Prior to their meeting, Majority Floor Leader Jon Echols, R-Oklahoma City, wrote in a Facebook post Tuesday morning it is possible revenue bills will begin to be drafted. But he wrote “hard work” and “compromise” will be needed to find a plan that can get the needed 76 votes required of revenue-raising measures. That’s especially difficult since a number of GOP lawmakers have said they would resist any tax increases, even if they are urged by Fallin and party leaders. Inman, meanwhile, said he remains grateful that Fallin is working toward a compromise. But he said because of the House GOP’s reluctance to support tax increases, he is even less optimistic about the prospect of a great bargain than he was last week. Inman added that the 28-member House Democratic caucus plans to formally endorse a plan with elements of the proposal that Fallin submitted in the next couple days. The impasse over how to close the $215 million budget shortfall didn’t stop lawmakers from advancing a bill, almost entirely written by an out-of-state conservative group, that would set up stricter eligibility checks for Medicaid recipients. The House Rules Committee voted 6-3 Thursday to advance the Restore Hope, Opportunity and Prosperity for Everyone (or HOPE) Act. The measure requires the Oklahoma Heath Care Authority to verify the eligibility of Medicaid enrollees during their initial application and on a quarterly basis to ensure they are still qualified. The proposal also directs the state to hire an independent contractor to help verify eligibility. If it is discovered that a Medicaid recipient no longer qualifies (for example, receiving a salary increase that puts the person over the income threshold), they will be sent a letter and given 10 business days to protest or they will lose coverage. Rep. Terry O’Donnell, R-Catoosa, who is sponsoring the bill, said “as stewards of the public’s money,” lawmakers would be “derelict in their duty” if they didn’t ensure those who received public assistance qualified for it. But the three Democrats on the panel questioned if the projected $1.2 million in upfront costs and $90,000 to $100,000 in recurring monthly fees would offset any savings. They raised additional concerns that someone could lose coverage if they didn’t have enough time to protest a finding that they are unqualified. Another area of concern from Democrats on the panel was where the bill came from. When asked by Rep. Steve Kouplen, D-Beggs, where the idea originated, O’Donnell said he only took up the bill because it was passed by the House and Senate last year but got hung up in its final stages. But he said senators asked for the bill during the special session because they have changed their minds on House amendments that sunk the bill in the spring. A review of the bill, however, shows that it originally was model legislation from the Foundation for Government Accountability. The Florida-based nonprofit advocates for free-market and conservative-aligned policies, such as fighting for deregulation and convincing states not to expand their Medicaid programs. The group has previously partnered with the similarly right-leaning Oklahoma Council of Public Affairs. Also, former state representative Tom Newell joined the group after he resigned from the Legislature late last year. House Bill 1093 passed out of the House Rules Committee on Thursday. Highlighted portions on one of the pages of the bill reflect exact excerpts from the model legislation put out by the Foundation for Government Accountability. Rep. David Perryman, D-Chickasha, said the outside origin of the bill shows that the policy is likely not needed in Oklahoma. He said supporters of the bill should first do their “due diligence” to prove there is substantial fraud and abuse. Perryman added that other states that have taken up the model legislation have run into problems when they worked with independent consulting services to verify eligibility. Kansas saw a backlog of thousands of Medicaid applications after it partnered with Accenture, one of the largest consulting firms in the world, and ran into problems with recipients incorrectly being denied coverage, Perryman said. The only winners from this type of legislation are contractors, who can receive millions of dollars of taxpayer money with no real assurance they will deliver on their promises, he said. “It isn’t hard to follow the money on this legislation,” he said. The HOPE Act and the other bill the committee advanced – exempting trucking companies from the new 1.5 percent tax on vehicle sales – are the only legislation that has been heard in committee other than the stalled cigarette tax increase. Lawmakers continued to meet behind closed doors throughout most of Thursday to find a deal that would restart formal floor proceedings for the session. 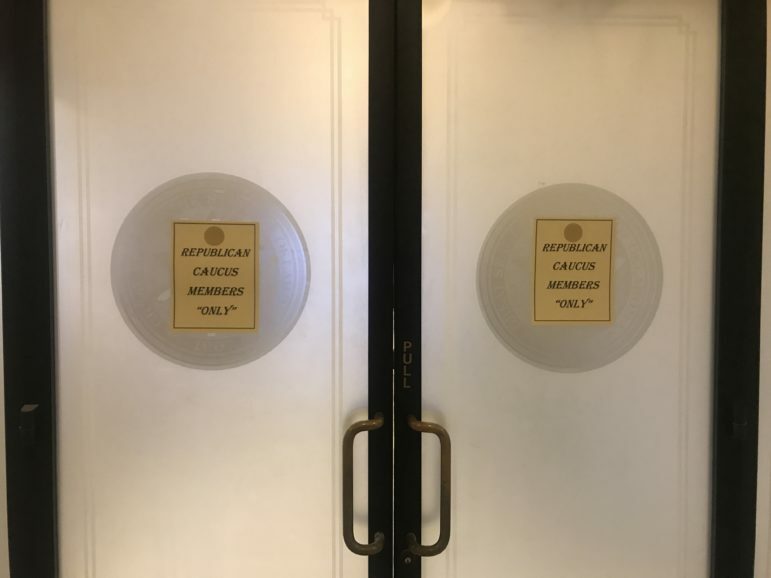 The House Republican Caucus spent much of Thursday meeting behind closed doors. As of Thursday evening, lawmakers have not been able to reach a revenue-raising deal. Legislators aren’t the only ones who returned to the Capitol for the special session. If it’s anything like the regular session, lobbyists will be picking up the tabs for pricey dinners and drinks during the days or weeks to come. Lobbyists spent almost half a million dollars on meals and gifts for lawmakers and other public officials during the spring session. A loophole in the state’s ethics rules will hide their spending to influence the special session until Jan. 15, 2018. It’s not clear how active lobbyists will be during the special session. A review of the last special session, in 2013, found that lobbyists spent $1,251, but the session was restricted to fixing tort reform laws. The call for this year’s special session is broader than in 2013. Tax increases on oil and gas, wind, motor vehicle fuel and dozens of services have all been discussed. And if budget cuts are required, everyone from teachers to health care providers will be angling to avoid the toughest cuts. Republican and Democratic leaders blamed each other Wednesday for the ongoing budget impasse. House Speaker Charles McCall, R-Atoka, abruptly canceled an expected vote on a proposed cigarette tax increase and announced the House would adjourn until a budget deal is reached. Minutes after leaving the House floor late Wednesday morning, McCall and Majority Floor Leader Rep. Jon Echols, R-Oklahoma City, said the cigarette tax vote – the centerpiece of House leadership’s plan to close the $215 million budget hole – was pulled because it was clear that not enough Democrats would support it. Echols said Republicans were prepared to deliver 75 percent of their caucus if Democrats would deliver the same share of their caucus. That would be just one vote away from the 76 votes needed to clear the three-fourths requirement for revenue-raising bills. But with under half of the 28-member Democratic caucus expected to support the proposal, Echols said GOP leaders didn’t want to waste time and taxpayer money by staying in session trying to pass a measure that would fail on the floor. Inman also said it is wrong for McCall to blame a failure of the cigarette tax on Democrats. He said if McCall could “lead,” he would’ve been able to bring his full 72-member caucus, which would be enough to pass the bill (with the expected 12 or so Democrats who also would back it). Inman additionally speculated that instead of making his members vote on a tax measure that would ultimately fail, McCall pulled the legislation because he wouldn’t even be able to convince 75 percent of House Republicans to back it. Despite the war of words, both party leaders held out hope that a bipartisan deal can be reached. The question, however, is what that would look like and when a deal would be made. Echols said lawmakers will stay at the Capitol with committee meetings, and behind-the-scenes budget negotiations continue. McCall added that talks with the governor, House Democrats and the Senate will include whether to increase gross production taxes on oil and gas – something that Republicans have been hesitant to support. Inman said a gross production tax increase must be part of any “grand bargain” budget deal that would bridge the $215 million shortfall and potentially leave leftover money for a teacher pay raise. The problem is that Democrats are holding fast at calling for the 2 percent rate that wells are taxed for their first 36 months of production to be raised to 5 percent. Republicans have so far balked at that high of a rate. But if a deal can be made, Inman said he would deliver all 28 House Democrats to pass the cigarette tax. And he said Democrats may support a Senate Republican plan to raise fuel taxes if it is paired with increasing income taxes on high earners. The House recessed after meeting for only a few minutes Wednesday morning. Speaker Charles McCall, R-Atoka, in a statement accused House Democrats of playing political games but said negotiations with the caucus and the governor continue. Lawmakers are expected to vote today on the $1.50-per-pack cigarette tax. The proposal is the centerpiece and chief revenue-raising measure in both the GOP’s House and Senate plans to bridge the $215 million shortfall. But an unlikely coalition of anti-tax Republicans and Democrats who don’t think the taxes go far enough could once again sink the proposal for the second time in four months. This group blocked the cigarette tax during the regular session. And if the same 63 lawmakers – 51 Republicans and 12 Democrats – who supported it at that time vote for it again, supporters will have to find 13 more yes votes to get to the needed three-fourths threshold. House Speaker Charles McCall, R-Atoka, said if 75 percent of the Democratic caucus (21 of the 28 members) votes in favor of the tax, he thinks he can convince 75 percent of his caucus (54 members) to support it. But, even in that case, they would need one more vote to hit 76 since there is one vacancy in the Legislature. To view which no votes would have to be flipped – and which yes votes need to be retained – take a look at the chart below. And some other votes to watch are the four lawmakers who didn’t vote on the bill during the regular session. This include Rep. Sean Roberts, R-Tulsa, who was an excused vote, and Rep. Zach Taylor, R-Seminole, who didn’t serve until later in the session. Newly sworn-in Democrats Reps. Karen Gaddis, D-Tulsa, and Jacob Rosecrants, D-Norman, will also being casting their first votes as lawmakers on the cigarette tax. The House Joint Committee on Appropriations and Budget voted Tuesday to advance the $1.50-per-pack cigarette tax increase. The decision will allow the full House to vote on the measure as early as Wednesday. But the approval margin (19-9 or 68% of the committee voting in favor) wouldn’t clear the constitutionally required three-fourths threshold once it is voted on the floor. Every Democrat, except Reps. Jason Dunnington, D-Oklahoma City, and Ben Loring, D-Miami, voted against the bill. And every Republican, except Reps. John Bennett, R-Sallisaw; Kevin Calvey, R-Oklahoma City; Jason Murphey, R-Guthrie; and Dustin Roberts, R-Durant, voted for it. The votes by the 28 committee members also almost completely mirrored how lawmakers voted earlier this year when they attempted to pass the cigarette tax as a revenue-raising measure that needed 76 votes (three-fourths of the chamber) to pass. That proposal failed on a 63-34 vote with 14 of the 26 Democrats voting no and 21 of the 72 Republicans voting no or not voting. Every committee member, except Rep. Charles Ortega, R-Altus, voted the same Tuesday as they did on the failed cigarette tax bill last year. Ortega was against it last year but voted in favor this year. A packed room of onlookers watched as the House Joint Committee on Appropriations and Budget heard the new cigarette tax bill. This is the only legislation that has been heard in committee so far in the special session, which is in its second day. But Republicans would need to flip many more no votes for the bill to be successful this time. If not, this will end the Legislature’s latest attempt to shore up the state’s budget. And it could lead lawmakers into a tricky Plan B scenario. To bridge the $215 million shortfall, they could be forced to cut budgets – something Gov. Mary Fallin says she will veto – or find bipartisan agreement on other revenue-raising proposals. Exchanges between Republicans and Democrats during Tuesday’s budget committee, which you can view below in the embedded tweet, showed finding consensus will be difficult. After the House committee vote, the Senate Joint Committee on Appropriations and Budget also passed the cigarette tax increase. The Senate JCAB’s 10-2 vote had a much higher level of support than the House JCAB. But, since it’s a revenue-raising bill, it must originate and pass the full House before it can be considered by the Senate. House Speaker Charles McCall, R-Atoka, told reporters during a press conference Monday afternoon that GOP leaders will suggest budget cuts as a way to make up the $215 million shortfall if there are not enough votes to pass the $1.50-per-pack cigarette tax increase. McCall said about 75 percent of the 72-member House Republican caucus would support the cigarette tax. He said if Democrats can deliver an equal proportion of their 28-member caucus, there will be enough votes to achieve the needed three-fourths majority. But whether enough Republicans and Democrats will support the plan remains unclear. In that case, McCall said House Republicans plan to consider budget cuts instead of returning to the negotiating table with Democrats to find additional revenue. McCall said the cigarette tax will be heard on the House floor either Wednesday or Thursday. He said the vote is the House GOP’s priority for the first week of the session. McCall additionally said passing the cigarette tax would also allow lawmakers to consider a proposal to give teachers a $1,000 pay increase for the next school year. But it’s not exactly clear how that would be funded. McCall said using carryover funds or making budget cuts could pay for the raises, which would cost about $53 million a year. The Oklahoma House of Representatives and Senate quickly gaveled out for the day in just under 15 minutes after convening Monday for the first day of the special session. Lawmakers were unable to take significant action on the nearly 200 bills that have been introduced because the state’s constitution requires a bill to be read three times on different days before lawmakers can pass legislation. Tuesday, however, will be more eventful as the House and Senate Joint Committee for Appropriations and Budget will meet and begin voting on bills that could be considered on the floor as early as Wednesday. Among the bills on the agenda is House Bill 1099, which would again try to increase taxes on cigarettes. That proposal is key to Republican plans to bridge the $215 million budget gap. Even though this would raise only $122 million, it would allow lawmakers to tap savings and cobble together enough money to avoid budget cuts. But, as I wrote last week, lawmakers on both sides of the aisle aren’t very optimistic that it can pass with the needed three-fourths votes in the House and Senate. House Democratic Leader Scott Inman, D-Del City, repeated Monday afternoon that even with some Democrats voting for it, he doesn’t think enough Republicans will back it. Inman said he could deliver his caucus if Republicans agree to increase gross production taxes or roll back some of the income tax cuts. But there was no agreement as of Monday afternoon. Inman said there are no plans to meet with Speaker Charles McCall, R-Atoka, or other House GOP leaders. Instead, he said, budget negotiations, going through the governor’s office, will continue. >House Bill 1114 from Speaker Charles McCall, R-Atoka: Increases the cigarette tax by an undefined amount. >House Bill 1104 from McCall: $2,000 pay raise for teachers. >House Bill 1006, House Bill 1007, House Bill 1008, House Bill 1009, House Bill 1010, House Bill 1011, House Bill 1012 and House Bill 1013 from House Democratic Leader Scott Inman, Del-City: Increases gross production tax at different rates.